This weekend was a blast. My dad came into town to take my husband and me to a Coldplay concert, which was… well, I think “Paradise” sums it up pretty well. ;o) We also got into Disney for a day, went to New Smyrna for a bit, and ate a TON of food. I need breaks from the daily grind like that to remind me how fun and artistic life can and should be on a much more frequent basis. I so often just get done with work and sit on the couch doing basically nothing. I often don’t want to put in the time to produce anything or I just don’t feel courageous or energetic enough to start something new. But today’s drawing made me realize that a piece of art doesn’t have to take weeks or months to create. Some of my favorite pieces from the artists I follow were probably completed in a matter of minutes or even seconds. 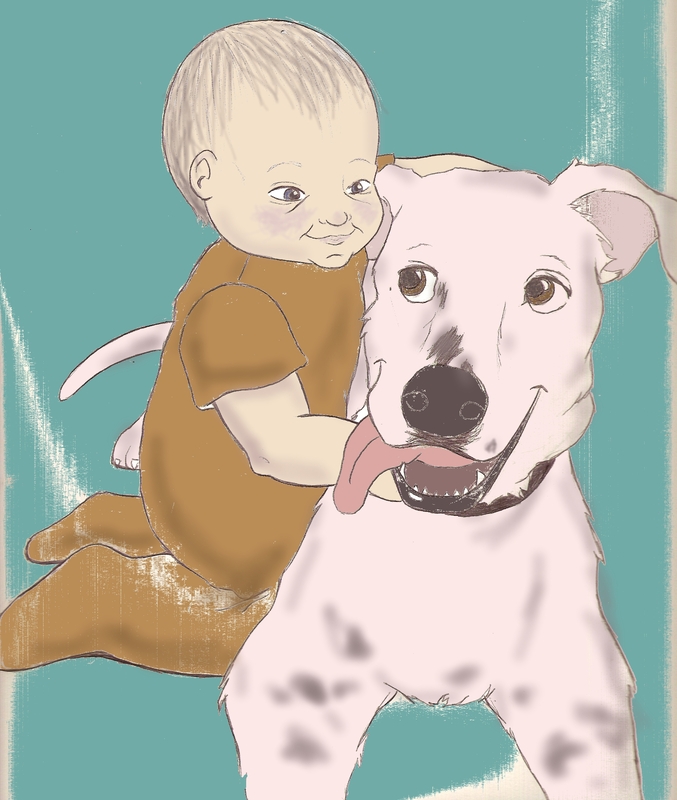 This piece is hopefully the first in a good series of Baby Moments. My Facebook has been “blowing up” with pictures of some of my closest friends’ little rugrats, and I decided this would be a great time to practice drawing fast, loose, and getting a good handle on the features of babies and children. My cousin and his wife just had their adorable little guy at the end of May, and he’s perfect camera fodder. Their dog, Andi, is also highly photogenic, so I thought I’d put the two together and see what I could come up with. I think Ryder’s head needs a little more size to it. I forget how large babies’ heads are compared to their bodies. But trying is how ya learn, so I’ll keep goin’. Here’s a slightly more shaded pic. Which do you like better?